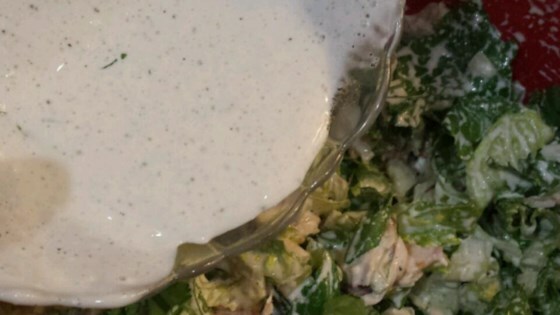 "Creamy dressing that you sometimes see as the house dressing at Mexican restaurants!" In a small bowl, whisk together the mayonnaise, milk, and lime juice. Season with cumin, salt, and pepper. Stir in cilantro just before serving. This was OK, but not one of my favorite dressings. I didn't think it especially enhanced a salad served with a mexican meal. I'll keep looking. I make this dressing any time we have taco salads. The only change I make is to reduce the salt to about 1/4 teaspoon. I love the cumin, lime, and cilantro combination! I used buttermilk and also added a couple teaspoons of taco seasoning mix. Nice flavor. I used this dressing on a green salad containing black beans, sweet corn kernals, diced tomatoes, red onion and tortilla chip strips. Everyone loved it! I didn't get a chance to taste this, but my sister did and she said it was good, that it, "tasted like taco".